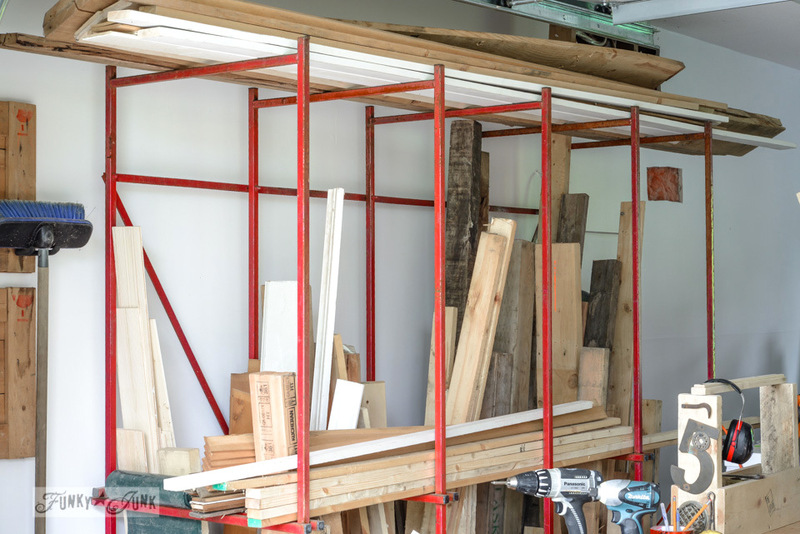 The metal storage rack for reclaimed wood is full! 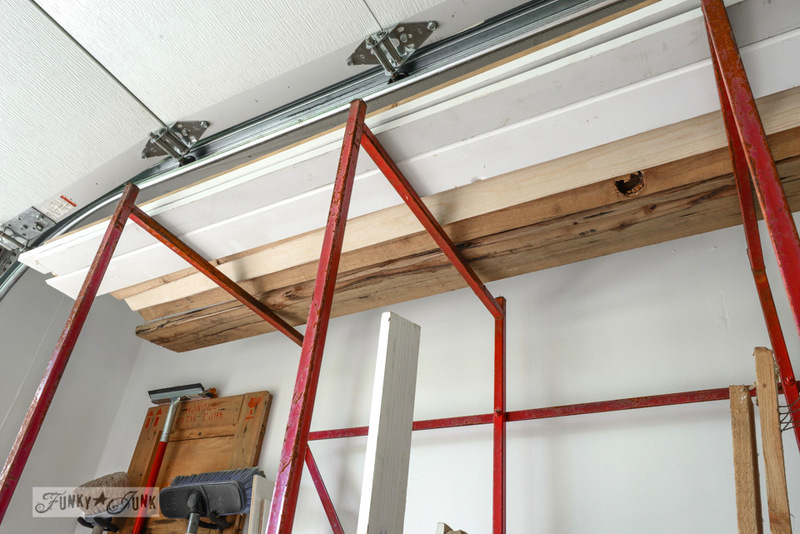 The beginnings of my dream workshop are coming to fruition! 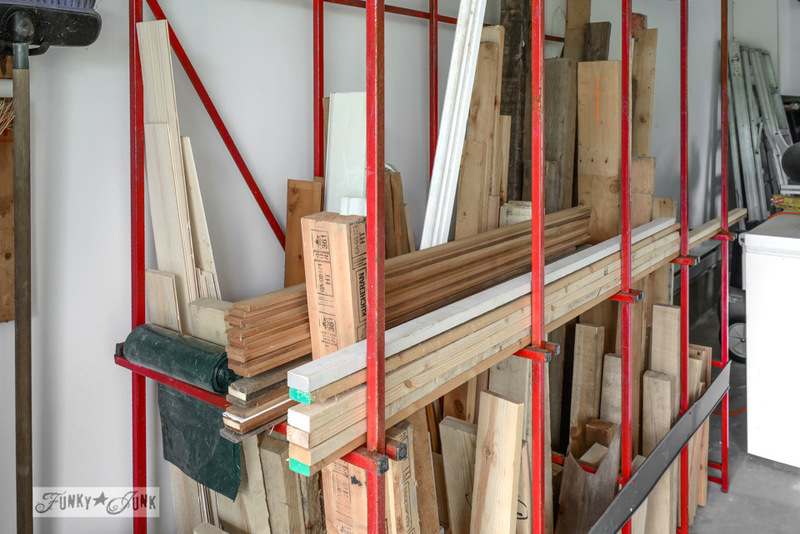 The dumpster found metal storage rack for reclaimed wood is full! Doesn’t it nearly bring a tear to your eye? I’m positively giddy over how organized and easy it is to find each piece and size! The unit didn’t need shelves at all. The longer pieces of wood fit perfectly over the top as is. I’m so glad I removed those crazy shelves from above now. 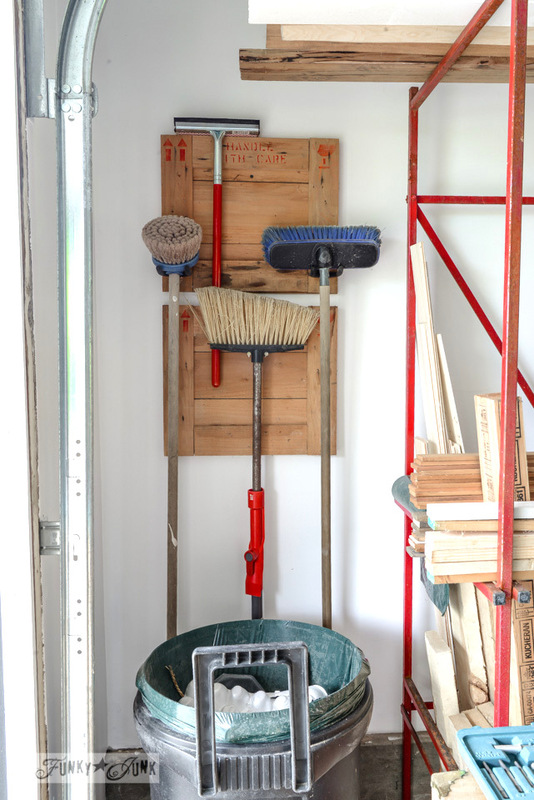 Needing a place for the brooms and brushes to hang, a broken crate was dismantled, utilizing the two end pieces for the hooks. The height of the rack couldn’t have been more perfect. 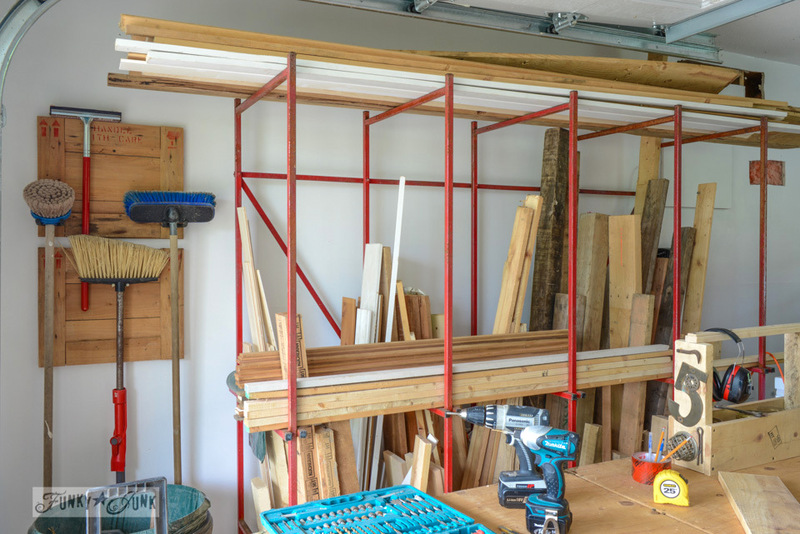 With no shelves, it allowed all the wood to stand upright, no matter what size. I worked in the ‘workshop’ today (can you legally call a garage a workshop if only 25% has been changed over? I say yes…) and pulled out my little portable workbench for extra work space. It fit awesome! But one day I’d love something a little sturdier and on wheels. This was a bit of a pain to reach over for more wood. So nice! Everything was within reach… and don’t you think this little corner is now mighty photogenic? Outside the garage door (I always have wide open) is my sanding area. I prefer to sand outside for the added ventilation. And the view and sunshine don’t hurt either. Once I clean up the rest of the garage, I love working in the back yard too. Here’s a previous post on my ‘outdoor workshop’. There’s a nice sized overhang along the front that provides the perfect protection from sun and rain. I really couldn’t ask for more. Haha.. dieing from this mess only 2 short days ago… I slept really good after cleaning this up. 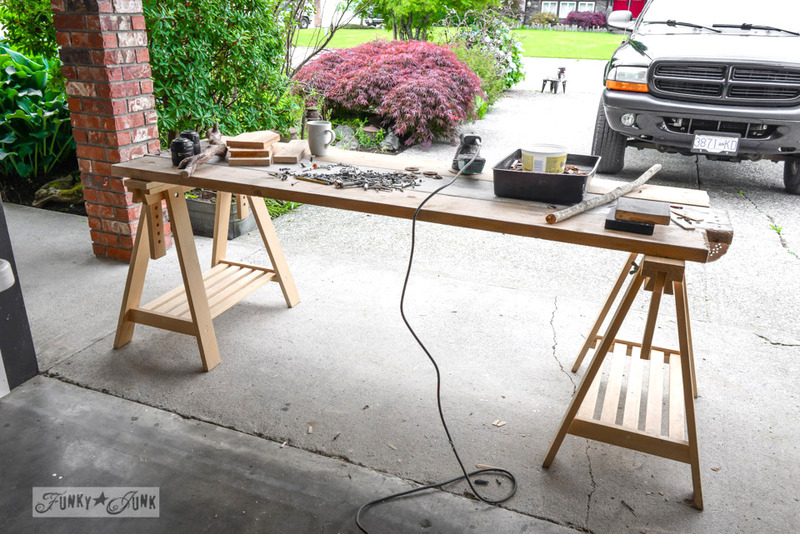 The sawing tables side isn’t pretty yet, but it is functional for now, until I can build my dream workbench, do something cool to the wall and put up rustic shelves… Hey, at least I could actually work on a project today. Not a bad transformation in 2 days, is it?! That looks so great Donna! What a perfect fit. Donna ~ What a fantastic job you have done in two days! I am proud of you and inspired by you. Thank you for posting this project. You go girl! 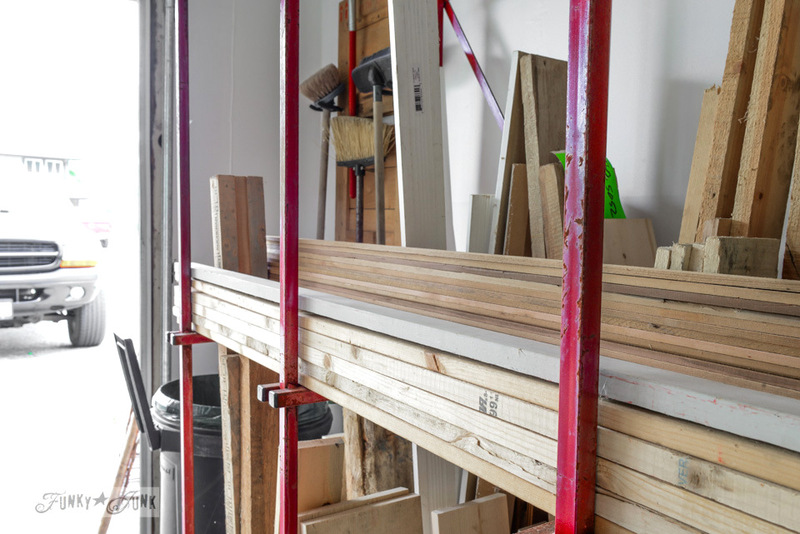 Not get to sanding and sawing, your workshop is all ready! Looking good, looking really good. This is looking fabulous! I wish I could get my husband to organize the garage to make it more “user friendly”. I’m Jealous! Only two days…???!!! I have been working for over a week and to the untrained eye…looks no better. Sigh. I do have tons of smalls, tinys and super tinys to organize though. I am very impressed with all you did…The rack is PERFECT. Enjoy! You go girl! Doesn’t it feel so good. Congrats on everything looking so nice. Holy smokes that thing worked out perfectly! What are the odds?! I bet you are just loving having all the wood so organized, I can only dream of such! 🙂 Great find Donna. The workshop is really looking good! What a great use of this rack!! My husband keeps trying to build something similar for all the reclaimed wood we have lying around. He needs to see this! Ohhhh I want a sliding chop saw too! BAD. Your comment on the living room vs workshop made me smile… BIG! Thanks!! Looks great! What a transformation. You’ve been working hard. What!? Oh come on, you can fit some more wood on that rack…..lol! This looks amazing! 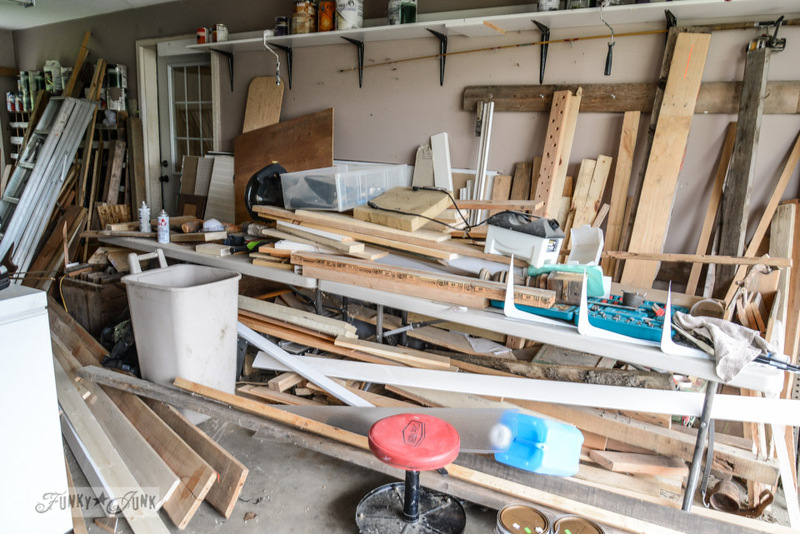 I think you could help me tackle my mess of wood! 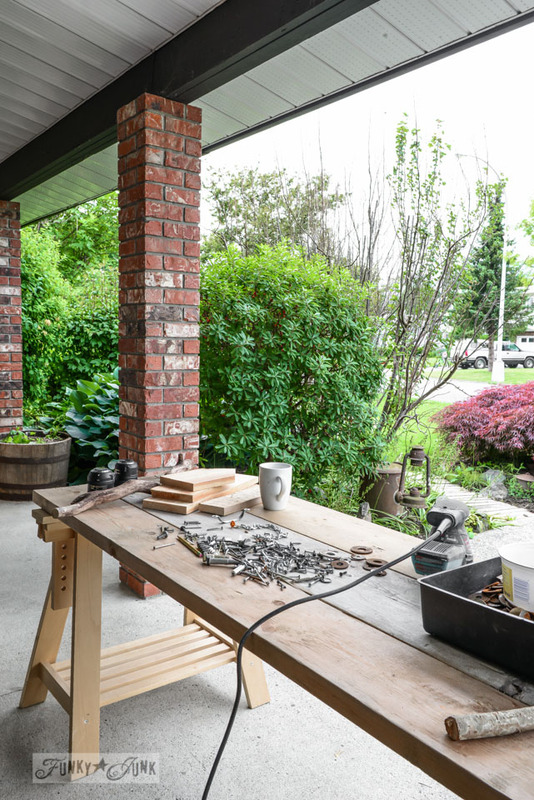 That is a pretty transformation and I am loving the outdoor sanding table… it could almost move right into the house as is, love those chunky planks! Great job Donna! 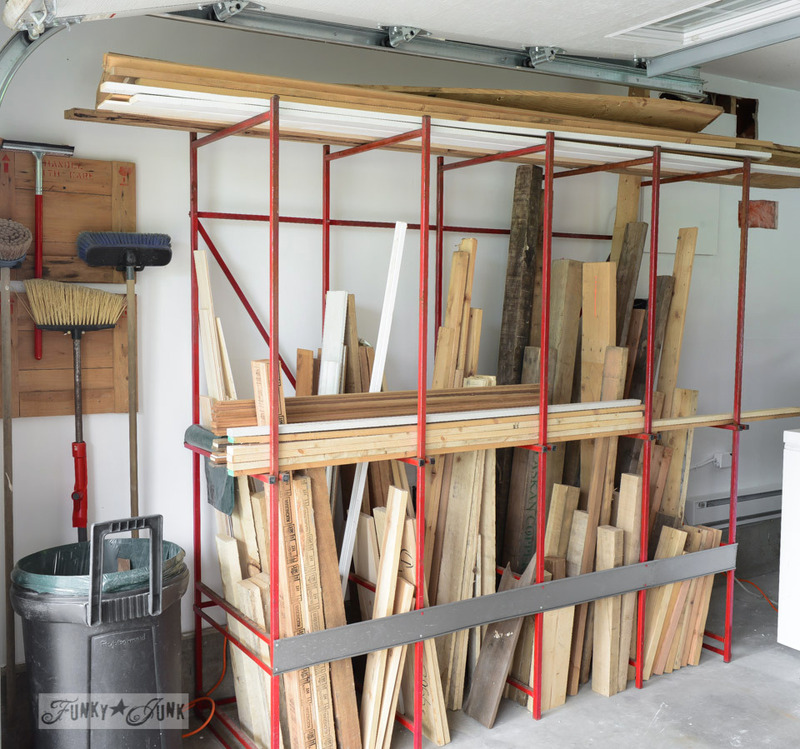 I have a secret to tell you… there’s more wood in the garage. It wouldn’t all fit! 😀 Guess I’d better get building! Oh, PERFECT! I only wish I could scam such a great thing! How fun and there are just some things in life that you happen to come across. That one had your name on it and you made it happen. Love, love, love!!! What a great space you have to create in now! You did a great job – lots of ideas to think about too! Enjoy the fruits of your labor! Wow! It looks great! Doesn’t it feel good inside when something gets organized? Small thing…I saw a toolbox yesterday at Goodwill and your voice was in my head saying $3? Buy that thang! You didn’t know you were in Vancouver (the other one) yesterday, did you? Beautiful job on the garage. Of course, you know how persuasive you are! WOW, Donna!!! What a transformation!!!! I am right now BATTLING my office (desk was so full of paper…) trying to put everything in place… But had to stop to read your post, HAHA!!!! Good for you, I imagine you will take way less time to do your projects, with the place all organized! That looks awesome! I love it all. Thanks for sharing. Have a great week. This is a thing of beauty that was meant to be! Serendipity I’d say. Fabulous! What a difference. You can be very, very proud of your “workshop”. I’m so envious! I have a huge old house/shed which I use as my workshop but I have to compete with dog grooming, laundry, storage, horse feed and tack. 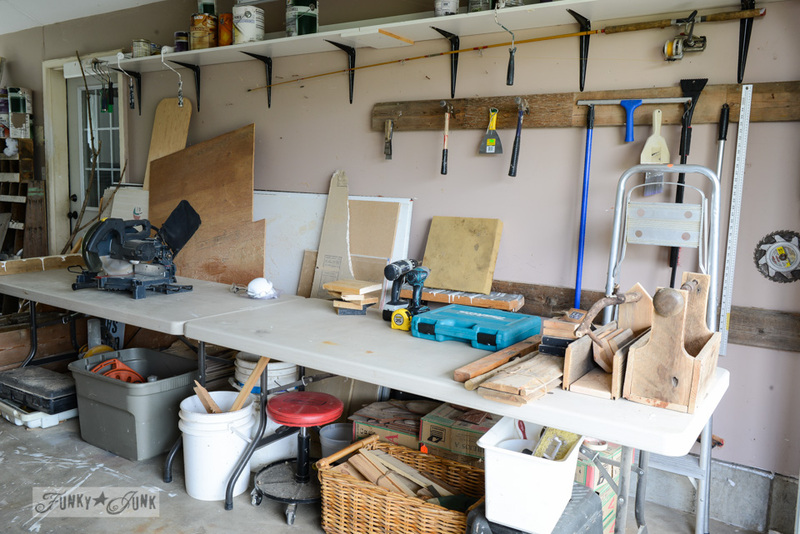 My workshop area is tiny compared to the size of the shed – and cramped full of stuff! Guess I should consider myself lucky to have any space at all huh? I love that rack and you were so lucky you didn’t have to paint it to make it cheerful! I look at every detail of your pictures so in the one with the saw horses, what is out by the street? Thanks for all the info you provide every week. I think it looks wonderful. It is so much easier when you are organized. 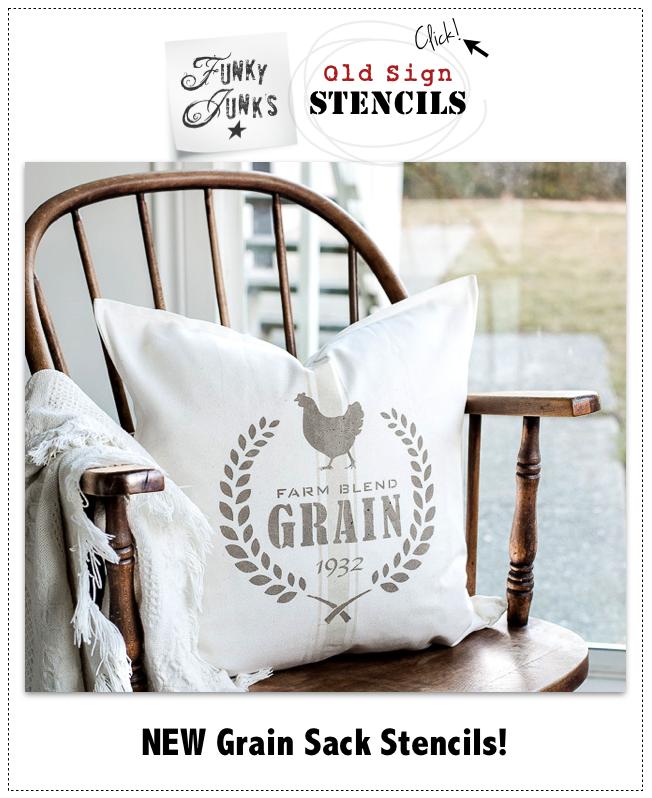 We are hoping to sell our house and move south sooner than later and my one must have next time is a garage or an out building that I can use as a work space. Since I retired I have organized my house and it is amazing how much time I save now. Keep up the good work. Awesomeness! 🙂 I bet you woke up the next morning and went straight to the garage to admire the transformation again and let that fabulous organization sink in. I know that’s what I would have done. 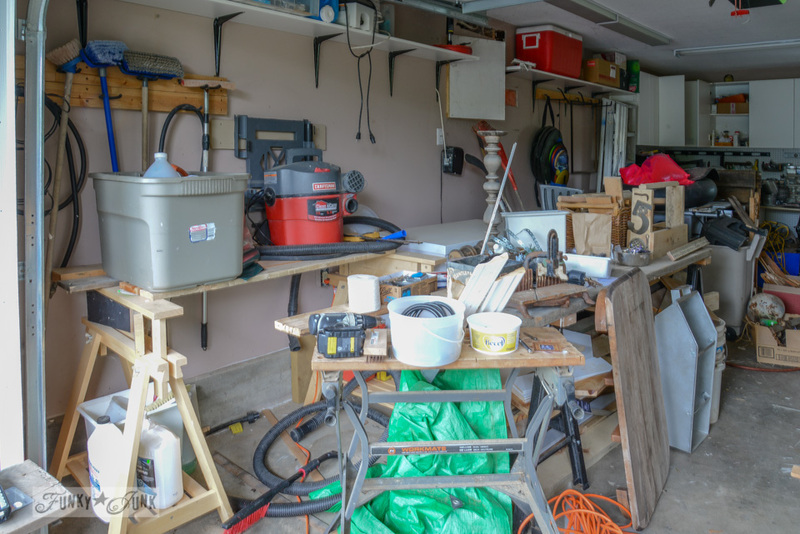 I’m about to tackle a similar garage cluttered nightmare and can’t wait to feel the liberating joy of having an uncluttered garage once again. I’m sure I’ll be spinning around with my arms outstretched like Julie Andrews in The Sound of Music once I get my open garage space back. And I see what you did there with the trash bags. Great job! I love this, I need something like this at my house. I love all of the things you do. Thanks for sharing. Wow Donna! You have been busy busy! It all looks great! WOW!!!! You did such an awesome job with the repurposed red metal rack!! The work area looks GREAT!!! You must be So happy with your new find! All that organization will certainly spur new creativity….as if you need more. Wow, I love the new space. Looks wonderful. I wish I had it. And I am still trying to get my laundry room just clear enough to walk in it. The walls are not even finished, has always been very ugly with just the rafters. I keep trying, but losing ground I believe. I have no way to get some plywood home to even do one wall. I have plans though. 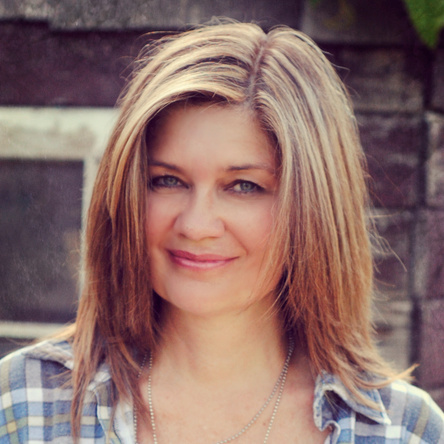 Donna – I love the red color of the rack so bright and fun! Your workshop is so organized now. It motivates me to work on ours this weekend! Wow Donna!! What a blessing. I know that was hard work. I am so happy for you. You will have that dream workshop in no time. Fantastic transformation!!! I can imagine your mind is going a zillion miles per hour thinking of things to make with all of the supplies you can see. It is such a boon to have things organized. I have not been able to get near my table saw for 3 years now due to SOMEONE having a bunch of crap…I mean good stuff stacked in front of it. This year is the year of edit, so I WILL have my saw out from under all of that diving equipment by fall. 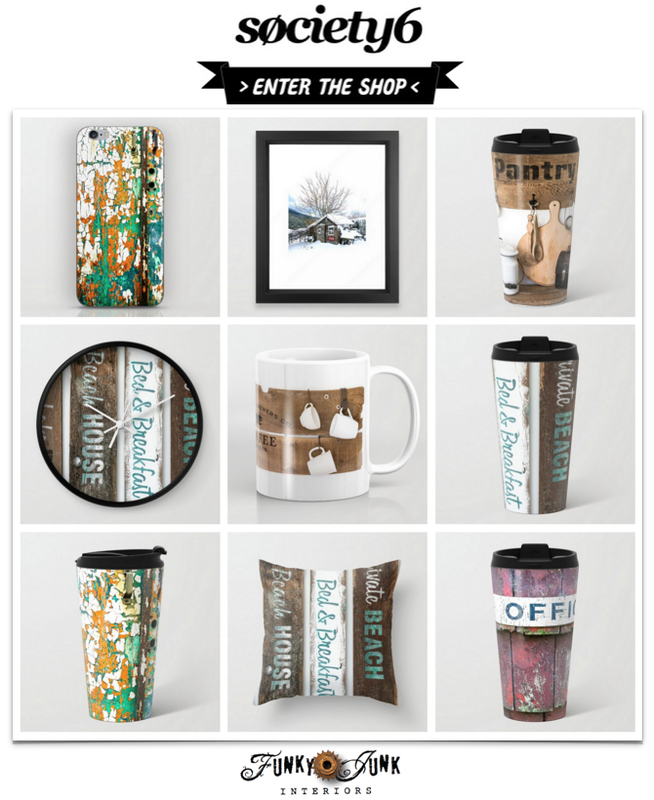 How do you keep the sawdust out of your coffee mug? The Ikea sawhorses are pretty dang cool. I dare not show this to my husband. He “wood” love to have all that wood and a bigger place to do his woodworking! I would love for him to have it! It looks fabulous! Something about the red and the wood combined strikes a pretty picture for sure. That red rack shined up real nice, kinda like an old Chevy, and what progress you’ve made and in only 2 days! Looking fantastic and so glad that you are enjoying your new organization. 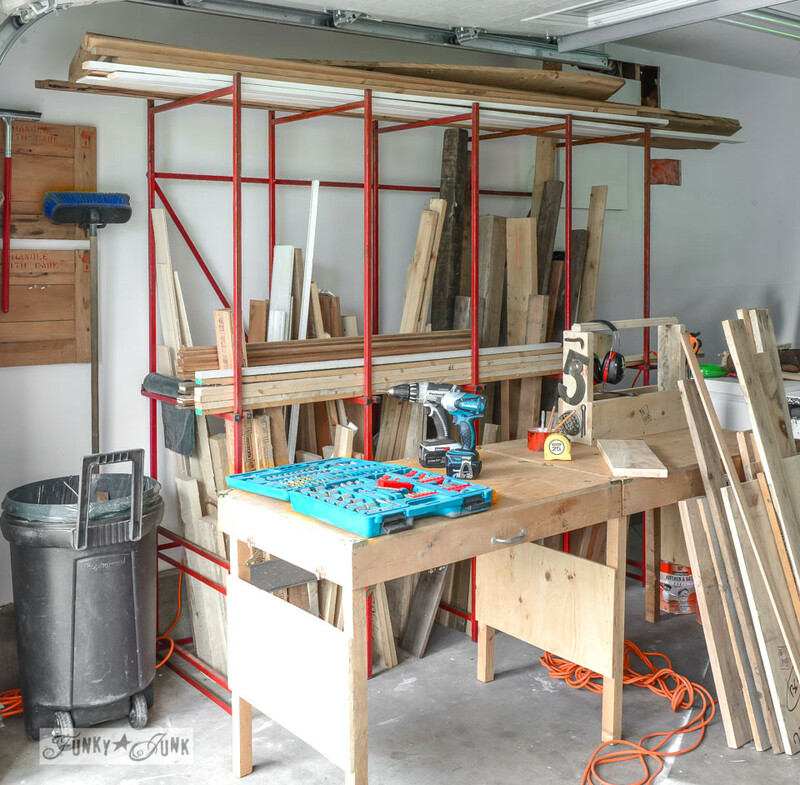 Hello…it is me again….the more I look at the rack I think I would have put the long boards on the middle “shelf” to the back…making the under wood pieces easier to get to.??? It looks like work to get to …… and retrieve them…Yes???? But… I love that it is all contained in one spot…and visual with no hunting around .